As many of you know my husband is in the Army, and he recently took command of a Battalion here in Georgia. It’s a job he’s been waiting 18 years for and we couldn’t be prouder of him. I love meeting the soldiers in his unit and interacting with them and their families so when he asked me if there was something we could gift the families at our unit holiday party I was up to the task and had the idea to make some glittered unit ornaments for each family! We needed to make at least fifty ornaments to hand out at the party so I wanted to be sure to choose something affordable but nice enough the families would want to hang it on their tree. I decided to glitter some plastic ornaments and then use my Silhouette to add a logo to them. I’ll share the Silhouette portion of the tutorial in another post-today I want to cover how easy it was to glitter the ornaments and compare how two different adhesives worked! I purchased two 25 packs of plain plastic ornaments from Michael’s for $10 each on sale. Because I’m always experimenting I decided to try half of the ornaments with this ornament glue and half of the ornaments using this flooring wax I had seen used in other tutorials. I also tried each on some spare glass ornaments I had laying around from a previous Christmas. Started by removing the tops from the ornaments and setting them aside. 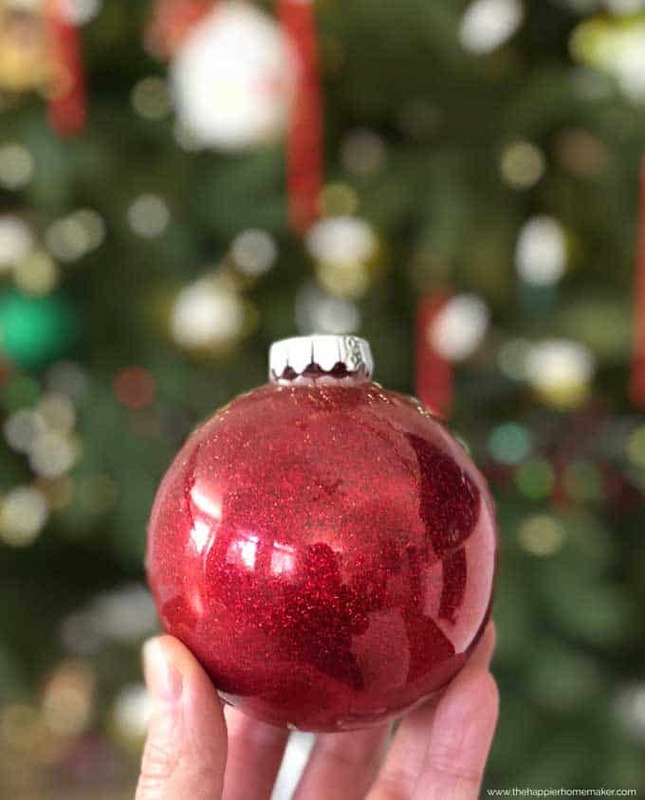 Carefully pour the ornament glue/floor wax into the ornament and rotate it to coat the inside. Then pour the excess back into the bottle or a small bowl or container. 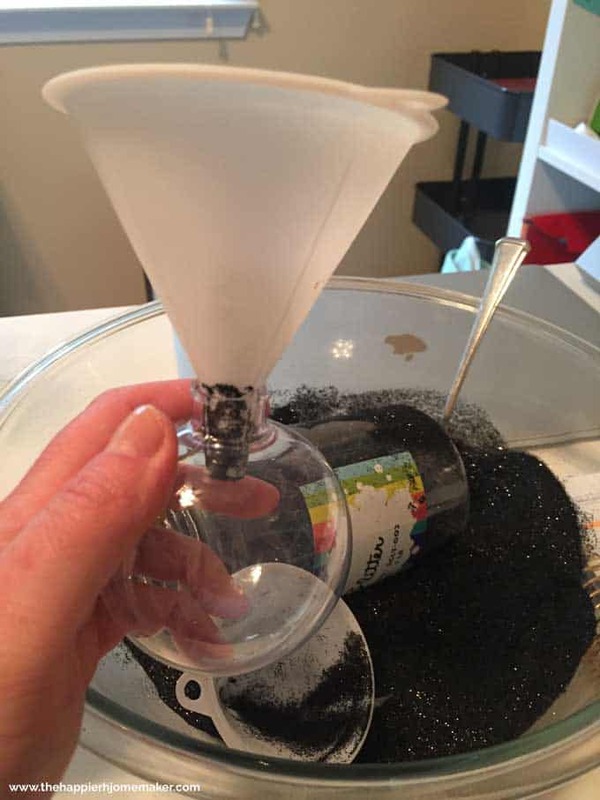 Using a funnel, add about a teaspoon of glitter to the ornament and again rotate to coat. Pour the excess glitter into a bowl and set aside to dry. Once dry put the caps back on and you’re all done! Both the floor wax and ornament glue attached the glitter to the ornament well enough but on close inspection, it was clear that the ornament glue gave better coverage on the plastic ornaments. You can see below how on the ornament on the right you can see the window light through the ornament whereas the ornament on the left that I used the ornament glue on had a more dense glitter covereage. 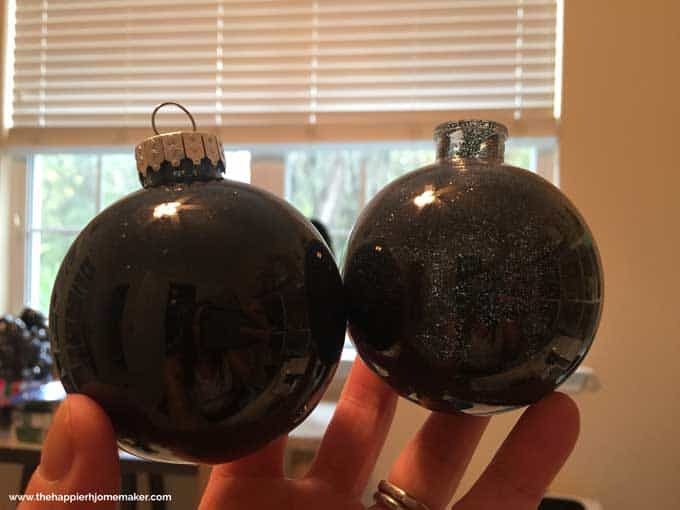 That being said, you can’t see much of a difference when the ornament is hanging on a tree and it was not as obvious on lighter colored glitters as it was with the black glitter. On the glass ornaments the coverage was almost identical, there was no difference at all. Below the gold was made using adhesive and the others using floor wax. 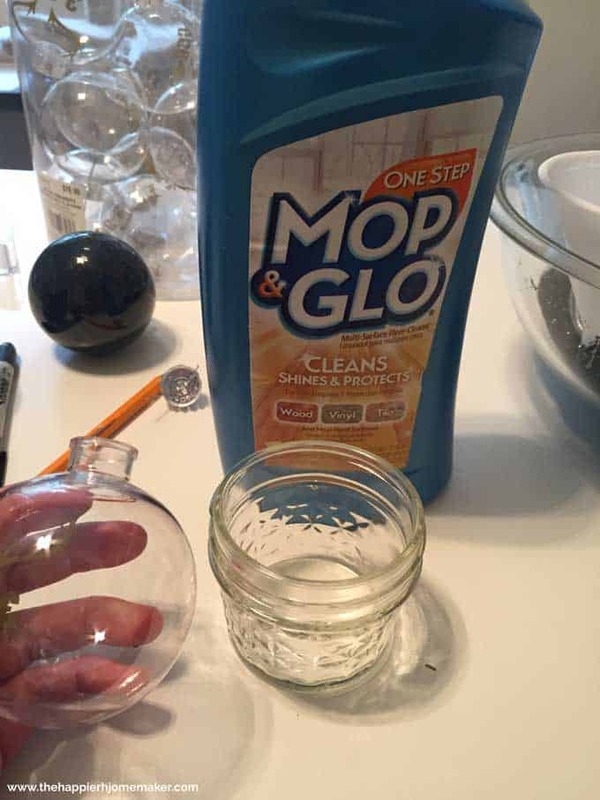 Overall I will probably continue to use the floor wax because it is less expensive and the lighter coverage on the plastic ornaments didn’t take away from the end result appearance of the ornament. 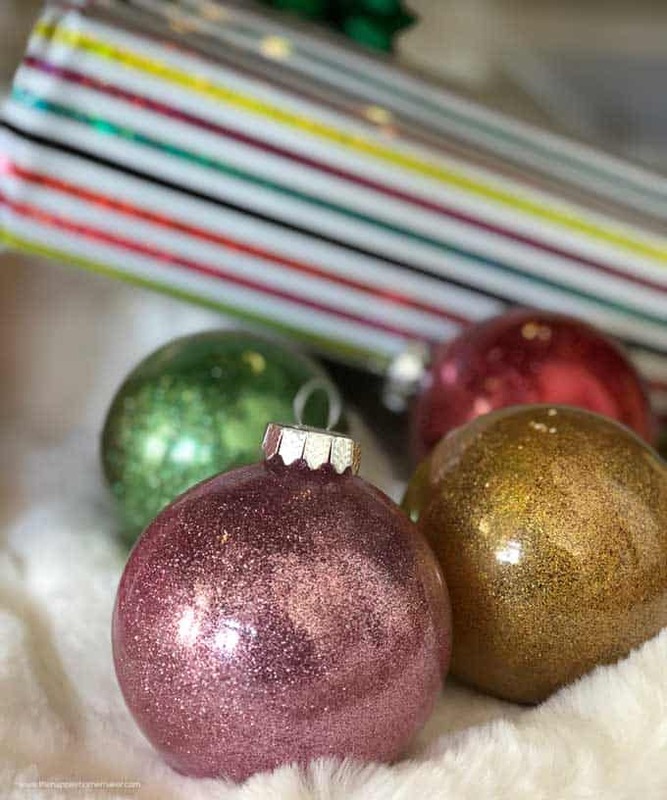 Have you glittered ornaments before? Which adhesive did you use? How did it turn out? I have made these several times and this is the best and my first ornaments from 3 years ago with this technique still looks as good as the first day I made them!!!! !